A 45 x 45 inch slate sundial hangs over the bay window. The dial is a vertical decliner with hour lines from 4am to 1pm. The gnomon has been damaged, but if you look carefully, there is a nodus and on the dial face are faint declination lines showing summer & winter solstices and the equinox. The hours are delineated on the hour and marked in Arabic numbers. A bronze horizontal dial with bronze figures of a bird with baby birds in nest and worm as gnomon. High on east facing wall of the Old State House, is a vertical declining originally built in 1713. The 6x4 foot dial is just above the third story window. Restored by R.N. Mayall in 1957. Background is faded blue. Hour lines are hard to see, but Roman numerals along edge are clearly visible. In upper left corner of dial, just above the gnomon, is a small yellow sun. No longer present; may have been removed during restoration in late 1990s. Sundial has been replaced with a clock. A stone horizontal dial on a pedestal about 4 ft. high donated to Harvard by class of 1870. A well-patinaed horizontal bronze dial on a stone pillar. A 10 foot diameter bronze and granite horizontal dial with bronze gnomon and Arabic hour numerals on a 2 foot high granite base. Craftspeople of Colonial days are pictured on the face of the sundial. Sculptures depict a grandpa holding a baby while looking at the dial from the east side and a child peeking from behind the 5 foot tall bronze gnomon. Each bronze hour numeral includes a scene sculpture. An east- declining vertical wood dial above the main doorway of the Rebecca Nurse House. Rebecca Nurse was a victim of the Salem witch trials in 1692. The House was restored in 1909 and it is believed this dial was added at that time; there is no evidence the house originally had a sundial. 1820 Federal style building owned by the Univ. of Mass. at Dartmouth. Referred to as the Sundial building because of a vertical dial over the main entrance. The horizontal dial is in the spiral shape of a Nautilus. The dial was originally built in the 1920's and located at Amelia Peabody's Sun House at 145 Powisset Stree in Dover, MA. Very large vertical dial mounted above the entrance to the Foxboro Research Center. With solstice and equinox lines and a noon analemma. A 5 foot diameter pink Canadian granite horizontal hours-until-sunset dial. The 8 inch thick granite slab weighs 2000 pounds and rests on a short recessed pedestal, appearing to float above the grass dome of a memorial garden. Lines for hour periods 2-12 are marked with Arabic numerals. The gnomon is a 3/8 inch brass rod protruding 4 inches above the dial face. The dial face is engraved, "HOURS UNTIL SUNSET" and, "READ TIP OF SHADOW." This sundial does not function in the usual manner that tells time of day. Rather, this dial tells the number of hours from the present time of day to the time of sunset. These are equal-period hours counted down until sunset. Since it shows a time period, rather than time-of-day, the dial accuracy is not affected by season of year, daylight saving time or longitude location within the local time zone. Further, this particular design uses a horizontal dial face, while most hours-until-sunset dials use a vertical face. This dial is dedicated as a memorial to Dr. Pallav Parakh, a much-loved surgeon who was killed in a tragic auto accident while walking in a crosswalk. A vertical south facing dial made of painted mahogany with an aluminum gnomon. The dial is in the shape of a shield 3 foot tall by 2 1/2 foot wide, following the seal of the Milton Academy. Around the edge are the hours in Roman numeral. An Equation of Time correction table is now missing, but does not detract from the beauty of the dial. A combination of horizontal dial and gnomonic projection dial. The dial is about 2 x 3 feet made of DuPont Corian sitting upon a simple wood pedestal. A small horizontal dial about 8 inches in diameter with a triangular brass gnomon tells Daylight Saving Time using Roman numerals. Then a larger gnomonic dial is inscribed on the remaining surface, telling time from the shadow of the tip of the triangular gnomon. The gnomonic dial has hourly analemmas,telling time using Arabic numbers in Standard Time. Both dial lines are offset for the longitude of 70 degrees west. The gnomonic dial has declination lines for each month. A small analemma on the meridian has the letters of the months, indicating how to read the hourly analemmas depending upon the date. The dial is built to be read from the north, so the user's shadow does not interfere. This 4-foot diameter armillary sphere is made of galvanized, painted and gold leafed steel. The dial is had forged and welded by Cassidy Brothers Forge. It was "Colorgalvanized" by Duncan Industries and gold leafed. It was made to specifications from Albert Waugh's book on sundials, including latitude and longitude corrections. The sundial is mounted on a cast stone pedestal and stands about 8 foot high. A vertical sundial built from Eastern White Pine local-grown timber. The dial face is 35x44 inches and the gnomon is a 3 inch long aluminum rod. Hour lines include analemmas and the spring and fall lines are painted different colors with corresponding dates identified. Solstice and equinox lines are shown. approx. 8 feet in diameter Roman numerals, with half-hour marks and compass rose. Dial sits on a rectangular stone pedestal. Bronze armillary dial about 40 inches in diameter. Has polar and meridional circles, with smaller ones at north and south poles. Gnomon is 1 inch in diameter. Dial is mounted on a wedge atop an octagonal stone pedesta. To enter Heritage Plantation there is a fee. For information phone 508-888-3300. This 5 foot x 7 foot vertical dial is painted onto the true south facing concrete wall of a commercial building. The gnomon and hour lines appear to be weathered copper or bronze. The hour lines are corrected for longitude, but may be in error by about 5 minutes. The dial is in relatively good condition, but the painted numerals are fading. The building itself has been in several hands over the last 10-15 years. A small horizontal dial about 16 inches square, with a plain gnomon that rises about 6 inches. Nearby is a building with a hard to find wall dial, covered by ivy. Mayall's 1938 edition of "Sundials" shows the sundial without the ivy. The dial sits on an ornate stone pillar resting on a two-step octagonal base. ca 18 inch diameter horizontal dial. Roman numerals, 5 AM to 7 PM. Zodiac signs in circle within numerals. Capricorn and Sagittarius misplaced. Gnomon replaced, 1991. Dial sits atop a two-step octagonal base, ornate carved pillar. 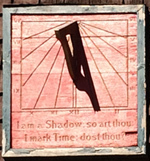 On the transom of a brown wood shingled and stone building that looks like it once was a church is a vertical south declining wooden sundial about 2 x 2 feet square. The sundial is painted red with a nicely cut wood gnomon. Hour lines and Roman numerals from VI to VI are chiseled into the wood, along with an inscription. The dial is framed in wood as well but the contrasting grey paint is flaking off. A wood vertical dial on the south side of a schoolhouse. Has hour lines from 6am to 6pm with Roman numerals at each hour. The gnomon radiates from a plain diamond in the center of the dial. A 1 foot diameter cast iron circular plate, with Roman numerals 5 am to 7 pm. Subdivided into 30 min increments on one ring, 10 minute increments on an adjacent one. Fastened with screws to a large rock. Reproduction of an authentic original cast iron dial from the Samuel Pierce House, Middleton, CT. Plaque reads "In grateful recognition for the leadership and service of Edward L. Clifford, Chairman of the Board of Trustees." A declining vertical sandstone dial approximately 3x6 feet with bronze gnomon. Mounted at 2nd floor level on large stone house. Roman numerals. Hour lines from 6 am-5 pm are not in standard vertical position, presumably offset to correct for wall not facing due South. Dial reclines approx 2 degrees north. Dial # 190 (Cambridge MA, Mt. Aubry Cemetery, Story Chapel) has same Whittier inscription. A small 14x14 inch rose granite square dial with an unassuming 5 inch high brass gnomon sits upon a round white 3 foot high granite column. At the base is a larger granite block. Built about 1899. A 15x5 foot hammer formed copper vertical dial declining 8? east of south with hour and half hour lines and Roman hour numerals. Gnomon is supported by dual braces. An EOT correction graph is provided and includes the inscription, "For every purpose there is a season" and acknowledgment to Friends of the Library and the Massachusetts Cultural Council. Stone pillar. Brass EOT graph Four-sided column. Dial on each face, with stone sphere containing a polar axis mounted on the top. Known as the Yalden dial. North gnomon has been placed incorrectly since at least the early 70's. A Victor E. Edwards bronze equatorial sundial. It has an unusual crescent shaped arm with notch at the upper end. The arm is rotated until sunlight through the notch strikes an analemma on the lower inner curve of the crescent. Time is then read on a circular dial from an "hour hand" pointer extending from the base of the crescent. ca 6' segment of cylinder, approx 3' high Metal Gnomon is intentionally omitted. Visitor stands centered in the curve of the cylinder and places finger on crossbar as directed. Shadow of finger indicates the time.